FILE - Congo opposition party supporters demonstrate during a rally against President Joseph Kabila running for president for a fourth term in Kinshasa, Democratic Republic of Congo, Sept. 15, 2015. Police fired shots and tear gas to break up a crowd Saturday before a political rally by opposition leader and potential presidential candidate Moise Katumbi in Democratic Republic of Congo, an official and the opposition said. Katumbi said in a statement that police had arrested people close to him, and that others had been injured in the incident in the city of Lubumbashi. But government spokesman Lambert Mende said police intervened to disperse people who were blocking roads, preventing normal traffic. No rally had been scheduled, he said. Political tension is high in Congo, where opponents of President Joseph Kabila say he is trying to cling to power beyond the end of his mandate in 2016. More than 40 people were killed in violent protests over the issue in January 2015. 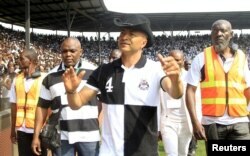 FILE - Moise Katumbi greets his supporters as he arrives to watch a soccer match in Lubumbashi, Oct. 4, 2015. Since then, authorities have arrested dozens of critics of Kabila on what the United Nations and human rights groups say are trumped up charges. Katumbi said the confrontation with police took place as he was about to speak at a rally. It was the second time opposition supporters had been tear-gassed in a week. "My message to the authorities is clear: nothing can weaken our peaceful combat for democracy," Katumbi said. Mende said everyone who had been arrested had been released except four of Katumbi's bodyguards who had not been authorized to work in Congo. "The shots were used to disperse the crowd," Mende said. Opposition parties endorsed Katumbi last month as their candidate for a presidential vote set for November, although the businessman has yet to say he will run. Lubumbashi is the largest city of copper-rich Katanga, which is Kabila's home region, but he has faced vigorous opposition there and several prominent supporters have defected from his ruling coalition over the last 18 months.